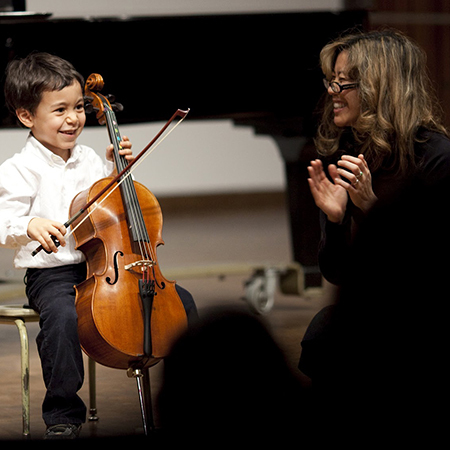 Cyrena Huang began cello in 1978 at the Guelph Suzuki School. She completed her Master’s Degree in Cello Performance in 1999 at the University of British Columbia where she worked for two years as teaching assistant and chamber music coach for Collegium Musicum, an early music course. She has performed in masterclasses with Steven Isserlis, Tsuyoshi Tsutsumi, Irene Sharpe and Janos Starker. Cyrena has been studying Suzuki cello pedagogy since 1991, in Guelph, ON, Edmonton, AB, Kitchener-Waterloo, ON and Salt Lake City, UT where she completed SAA cello teacher training in Units 1A, 1B, 2, 3, 4, 5, 6 and 7. She has performed as baroque cellist with the Modern Baroque Opera Company, the Pacific Baroque Orchestra and on tenor and bass viola da gamba in Kawasha’s Crew and has recorded several times for the CBC. Her interest in jazz led her to study with the Turtle Island String Quartet at the Stanford Jazz Festival in 1994 and performed with Canadian jazz icon Karin Plato in 2005. As a modern cellist she has performed with the Richmond, Fraser Valley, Prince George, Okanagan, and Vancouver Symphony Orchestras, The Vancouver Opera Orchestra, The Elektra Women’s Choir, The Vancouver Cantata Singers and recorded with the rock band 54-40 for their album Since When and with the band Nickelback on the track Hero for the Spiderman movie soundtrack. A flamenco dancer and teacher, she teaches two children’s classes at Al Mozaico Flamenco Dance Academy and performs occasionally at the Kino Cafe. She has recently been exploring flamenco cello, performing in the White Rock Flamenco Festival and Vancouver Flamenco Festival with local flamenco dancers, singers and guitarists, and in the productions Poemas de Alegria and Cafe de Chinitas with the Mozaico Flamenco Dance Company and at the Vancouver International Dance Festival. She recently won a grant to work with choreographer and flamenco dancer Andrea Williams to choreograph and perform a flamenco piece to the Unaccompanied Cello Sonata by Zoltán Kodály in May 2011. In her spare time she likes to sing flamenco in the shower and while driving, and will occasionally sing at student shows and parties when not feeling too shy or when plied with enough sangria.